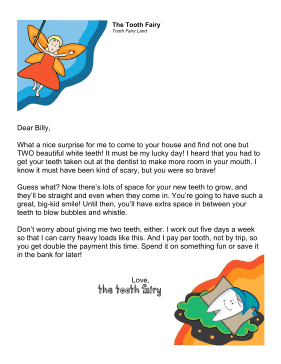 This free, printable letter from the tooth fairy is for children who lose more than one tooth and rewards them for both teeth. What a nice surprise for me to come to your house and find not one but TWO beautiful white teeth! It must be my lucky day! I heard that you had to get your teeth taken out at the dentist to make more room in your mouth. I know it must have been kind of scary, but you were so brave! Guess what? Now there's lots of space for your new teeth to grow, and they'll be straight and even when they come in. You're going to have such a great, big-kid smile! Until then, you'll have extra space in between your teeth to blow bubbles and whistle. Don't worry about giving me two teeth, either. I work out five days a week so that I can carry heavy loads like this. And I pay per tooth, not by trip, so you get double the payment this time. Spend it on something fun or save it in the bank for later!